Robert Harris: 13th-15th great grandfather of many of us. With our early family well researched many of us are turning to our female lines with Robert Harris being one of the more influential ancestors of a great many of us. 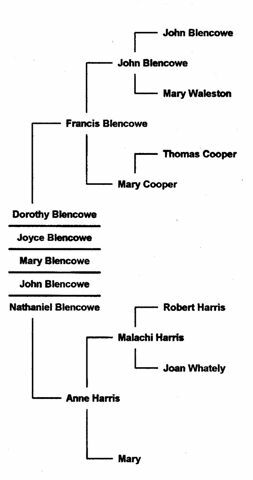 Francis Blencowe (1639-1692), son of John of Radstone married Anne Harris at Hinton in the Hedges in 1669. Anne's grandfather Robert Harris was a renowned Puritan, a Divine of Westminster and President of Trinity College, Oxford. His son, Malachi was Anne's father. The Puritans sought to reform the Church of England. In 1642, civil war broke out between the Crown's forces, called the Royalists and the Puritans led by Oliver Cromwell. Harris did not openly voice his preference during the civil war. Robert Harris was born in 1581 to John Harris, and Elizabeth Hyron at Broad Campden, Gloucestershire. He was educated at the free schools of Chipping Campden and Worcester and matriculated, aged 15, at Magdalen Hall, Oxford, in 1597. As his family was poor, Harris taught Greek and Hebrew to pay for tuition in philosophy. He graduated Bachelor of Arts in 1600, and though originally intended for the law decided to enter the church. 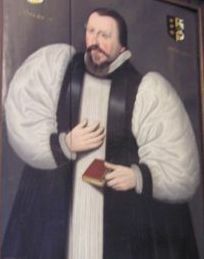 In 1604 Harris preached his first sermon at Chipping Campden. On 20 May 1606 Harris married Joane Whately, the sister of William, Vicar of Banbury. In 1607, Malachi, the first of many children was born. Historians record Harris as a model father. Joane shared her husband's deep interest in religious matters. She developed religious mania and eventually lost her sanity. In 1607 Sir Anthony Cope offered Robert the position of Rector of Hanwell, Oxfordshire. The Hanwell parsonage became a favourite resort for Oxford students. While teaching students at his house Harris continued to study theology at Oxford and in 1614 he achieved a Bachelor of Divinity. Robert was described as a man 'grave without affectation, pleasant without levity who did not make a show of his great learning.' (S. Clarke, A Collection of the Lives of Ten Eminent Divines, 1662, 305), A sermon entitled The Drunkard's Cup (1630) might suggest a stereotypical puritan, raging against the evils of loose living, and the work certainly contains its share of dire warnings. But it also discusses the causes of drunkenness: gentlemen not only set a bad moral example in patronizing taverns, but also made it harder in practice for the magistrates to police them. Many of Robert Harris' sermons are available from good libraries and their message is often relevant today. Harris, staunch puritan and parliamentarian, won fame as a preacher at various London and Oxford churches. In 1642 he was chosen one of the puritan divines fit to be consulted by parliament, and so preached before the House of Commons. When Hanwell was invaded by royalist troopers who behaved badly, Robert Harris preached to them from James 5:12 about their swearing. It so convicted the uncouth soldiers that one threatened to shoot him. In Harris' own words his belongings had been “pillaged” and buildings “turned to ashes by the fury of fire and sword”. Robert and his family fled to London (1642), where he was made one of the Assembly of Divines, and appointed to St. Botolph's, Bishopsgate. In 1646 he was ordered to Oxford as one of six divines commissioned to preach and invade any pulpit they pleased. From 1647 to 1658, Robert was visitor to the university. In 1647 he preached his first visitation sermon at St. Mary's defending himself from the charge of pluralism. In 1648 the chancellor, Lord Pembroke, admitted Harris to the degree of Doctor of Divinity, and made him President of Trinity College, Oxford and minister at Garsington. Robert conscientiously fulfilled all his duties, lecturing weekly at All Souls' College and preaching on Sundays at Garsington. He governed the college well for ten years. Robert Harris died on 1 Dec. 1658, at the age of 77, shortly after writing a letter of advice to his children; it is published in his biography (still available). He was buried in Trinity College chapel. Robert Harris was satirised and caricatured by the royalists as a notorious pluralist, called “a fanatical hero,” and described as one of the most eminent divines for preaching and practical theology He was liberal to the posterity of the founder of Trinity, was a good Hebrew scholar and well versed in church history. Robert's son, Malachi Harris (1607- 1684) can also boast an impressive curriculum vitae progressing from a B.A. and M.A to B.D then D.D. (1660) from Cambridge. He was Minister of Holy Trinity, Utrecht, an Anglican church in the Netherlands, 1643-44, Vicar of Navestock, Essex, 1656-60 from which he was ejected like his father from Hanwell for the Presbyterian bias in his preaching. He was Rector of Farthinghoe, Northants, 1661-62 where he was buried in 1684. He was Chaplain to Mary, Princess of Orange (mother of William III) and Chaplain to Charles II. Reference: Dictionary of National Biography 1891 & 2005 & Alumni Oxonians. I wish to thank John Wintrip and Phil Bailey for their help in researching Robert Harris.